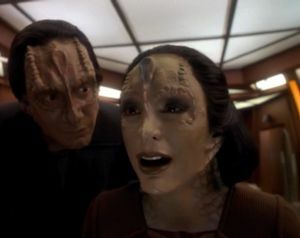 Kira is taken by Cardassians who explain to her that she is actually one of them who has been under deep cover for many years. Here's another boring intro. Oh no, Kira's personnel records are a little off! "Commander, this is extortion." "Yes, it is." The timing of Sisko's rescue at the end is a little too convenient. This is a neat little episode--"Face of the Enemy" meets Total Recall--and it works pretty well. The only downside is that, since this is episodic television, the audience never has any reason to believe that Kira could actually be a Cardassian spy. Still, it shows how Kira would react under extreme psychological stress, and it develops more mythology surrounding the Cardassian underground and Cardassian politics. Though we never learn the fate of the real Iliana Ghemor, we do see her father again in "Ties of Blood and Water."